Let's face it, life is busy and while we might mean well, there's still a lot of guesswork when it comes to our nutrition. You put healthy ingredients in your blender and hope your smoothie tastes great and is good for you. While clean eating and good gut health has gained much attention in Australia, nine in 10 of us are still struggling to get an adequate intake of vegetables, while one in two are not consuming enough fruit1. NutriBullet, which introduced nutrition extraction to the world 15 years ago, is now changing the game again with its next evolution of blending. Nutrition extraction is the process of breaking foods down to the point where they are essentially pre-digested, making it much easier for the body to absorb the wealth of nutrition locked inside fruits and vegetables. Just launched in Australia, the new tech-savvy NutriBullet BalanceTM (RRP $279) and its free app is eliminating all the guesswork by weighing your ingredients in real time to then breakdown nutritional information and calorie intake. It's your very own virtual nutritionist – ensuring consistency of taste, and transparency of nutritional information. 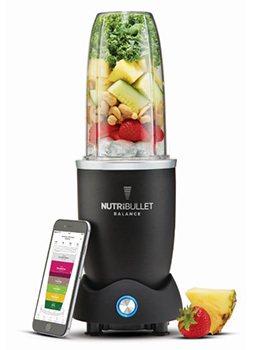 NutriBullet Balance has a built-in Smart Nutrition SensorTM that connects to the app via Bluetooth through any smart device (Android or iOS) to visually count calories, protein, carbohydrates, fat, and sugar intake based on the chosen ingredients. The app, available through Apple Store or Google Play, is packed full of recipes to choose from and was developed by NutriBullet's team of registered dieticians, nutritionists and food scientists, for every dietary requirement, health goal and mood. You can also easily create and track your own blends. The app also allows users to create plans for optimum wellness, build shopping lists, and track items in their pantry. NutriBullet Balance also automatically starts and stops for perfectly timed extractions for each recipe. Rugby Australia's Wallabies and Wallaroos Performance Dietitian, Associate Professor Dr Kate Pumpa, says you don't need to be an athlete to reap the rewards of understanding exactly what you're putting into your body. "It's not only important to know your calorie intake but what those calories are made up of exactly," she says. "The foods we eat are made up of carbohydrates, proteins, fats, and contain a range of vitamins and minerals. Each of these nutrients plays an important role in the body and enables us to remain healthy and active. For example, iron is particularly important to move oxygen throughout the body. If we don't eat sufficient iron-rich foods in our diet, such as green leafy vegetables, we can become quite fatigued which negatively impacts our ability to think and function efficiently." Dr Pumpa says smoothies or NutriBlasts are a great option for quick meals such as breakfast, or for pre or post workouts. "A breakfast NutriBlast should encompass wholegrain carbohydrates, be high in protein and contain healthy monounsaturated or polyunsaturated fats. You could achieve this with a skim milk smoothie adding in a banana, some oats and perhaps some almond meal to add flavour and extra calories to keep you feeling fuller for longer," says Dr Pumpa. "NutriBlasts are also a great option to consume pre and post workouts. Due to their liquid nature, smoothies have a quick gastric emptying rate compared to a whole meal, therefore are a suitable choice before exercise to prevent an upset stomach while also stocking up on the fuel we need to exercise. "Meanwhile, post workout NutriBlasts enable a fast delivery of nutrients to help muscle growth and recovery. For a post exercise NutriBlast, I recommend skim milk to hit your protein target, a banana to top up your carbohydrate stores, and berries to add antioxidants that may help reduce your muscle soreness." So how many calories should we be having in a NutriBlast? "It totally depends on goals," says Dr Pumpa. "For example, if you are an athlete who is trying to gain mass, NutriBlasts can be a great way to add in additional calories. Some of the athletes I work with, who use NutriBullet balance and love it, struggle to eat the volume of food required to meet their energy requirements, therefore liquid calories are really handy. "Also, if you are trying to reduce your body mass, then identifying lower calorie smoothies that would focus more on nutrient dense, low energy ingredients would be more advantageous." NutriBullet Balance - Bluetooth Enabled Smart Blender is a lot bigger than I expected with a base of 7 inches and cups another 7 inches in height. But it's powerful, this 1200w blender has very sharp blades and some suction cup feet to keep the blender stable and in place. Comes with 2 rather large cups so be careful of your portions sizes or blend for 2 or more. The NutriBullet Balance connects to your smart phone through Bluetooth allowing you to calculate the calorie density of each ingredient using the precise scale built into the NutriBullet Balance. As you add your available ingredients, tap on the description (ie blueberries, almonds, ice) and the total calories of the mix will appear in the App. There are a number of recipes available within the app you can follow or make your own. As you add each item the bar-graph shown in the app will help you keep track of the calories. The NutriBullet Balance comes with a spill proof travel drink containers so you can take your creation with you. The app allows you to mark your favourites in the recipe list or add your own recipe and calculate its calories. 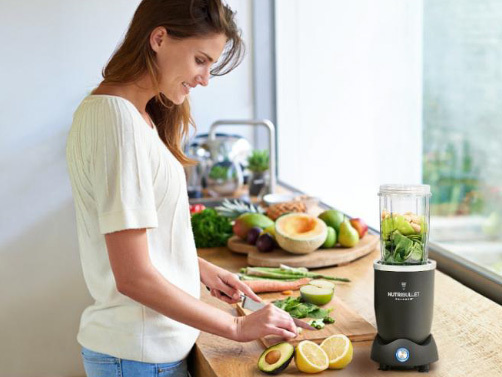 The NutriBullet is not limited to smoothies; it's also great for Soups, Dips, Sauces, Gravy and Salad Dressings. It is powerful and allows you to liquefy most foods. It's designed for regular use and easy to clean (dishwasher safe), plus eliminates measuring cups, cutting down cleaning and blending time. The only downside is the NutriBullet Balance feels a bit 'supersized', since I'm only 5"4, but the upside is that I'm bringing the family in on my blending journey. It's not the most used item in the kitchen. About Kate Pumpa Associate Professor Kate Pumpa is an Accredited Exercise Physiologist and Accredited Practicing Sports Dietitian who teaches Exercise Physiology at The University of Canberra. Kate is the current Performance Dietitian for Rugby Australia's Wallabies, Wallaroos and development programs, and the Performance Dietitian for the University of Canberra Capitals. Kate completed her PhD at the Australian Institute of Sport in 2008 before consulting as a Sports Dietitian to Leinster Rugby Club based in Dublin, Ireland until 2010. As an Accredited Sports Dietitian Kate has expertise in utilising nutritional interventions to enhance sporting performance, particularly in Rugby Union and basketball.